Transferring schools from OCCC can be a stressful experience for many students. However, the school offers multiple outlets to ease the burden of the transfer process, including hosting various schools and universities at the colleges Transfer Center. Students looking to transfer have multiple options of local schools who often send representatives to the Transfer Center, located on the first floor of the Main Building. Institutions such as the University of Oklahoma, Oklahoma Christian University, DeVry and the University of Central Oklahoma send connections to the Transfer Center, even during the summer session. Chuck Flint works in the office of admissions for Oklahoma City University and was recently representing the school at the Transfer Center. Flint is also the coordinator of military admissions and affairs for OCU, he said. Even though OCU is a private school and is more expensive than most schools in the area, the school is a part of the Yellow Ribbon tuition assistance program to make tuition more affordable for veterans, he said. “All the schools are trying to help returning military people get into college,” Flint said. One of the most popular programs for OCCC transfers is OCU’s nursing program, he said. According to Flint, most OCCC classes transfer to OCU. Flint said many nursing students take their basics at OCCC and then transfer to OCU. “I can’t say every class transfers, but we have a really good relationship with OCCC and there is always a petition process if the class doesn’t transfer,” Flint said. Kasie Warr, a music business major, transferred her OCCC credits to the Academy of Contemporary Music at UCO last spring. “The transfer process was easy,” Warr said. Flint said OCU is known for its performing arts, business and nursing programs mostly, but the school offers many other majors. OCU also boasts an impressive athletics resume with a lot of NAIA national championships, most recently in cheerleading, Flint said. Flint said he is usually representing OCU at the Transfer Center every week. 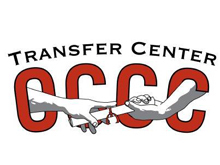 Another great resource for students looking to transfer is the Transfer Center’s website. The site offers links to contacts from various schools, a schedule of the universities sending a representative to the Transfer Center, as well as helpful tips and checklists for transferring students. For more information on transferring to a different school or to speak to an adviser, visit the Transfer Center’s website at www.occc.edu/TransferCenter  or call 405-682-7567.